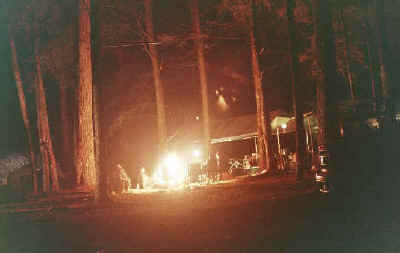 The "Annual Manly Man's Winter Camping Trip" is a group of guys that get together every year for fun and fellowship around the campfire for a full weekend. We cook, hike, tell stories (some of them are even true) and lift our legs. It started with four guys and has turned into a large family built on traditions that have evolved over the past two decades We have our own set of Tribal Laws. Through the years we have collected an assortment of pictures and items to share. We spend a weekend in the mountains doing that Male Bonding Thing. Please enjoy these pages and let me now what you think. Feel free to share this site with your other friends around the world. The News page will have the latest updates added with a history of what was completed. Please remember that this is a work in process. If you have any suggestions or something that you would like to share with everyone else or want me to add a page please feel free to send me your typed e-mail and I will add it in. Anything that the other Manly Men can help with would be great. That's Corry above in the Red Long Johns, Good Ol' boy work boots and a Six Shooter on his hips. That is the way he comes out of his tent in the mornings. Our mission is to spend a weekend surviving outside in what every weather we have. Sleeping in Sleeping bags, in tents, Cooking outdoors, and keeping warm by the fire. We do this in the dead of Winter in the North Carolina Mountains. This is our Leader Ralph Boone. You will find Ralph Boone on all of the Apparel that we have created through the years. He is the ultimate Winter Camper. 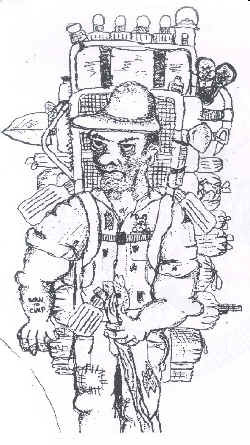 He takes everything including the Kitchen Sink, Wood Stove like Morris Abercrombie, the Potty seat like Greg Price, a double bed like Lee Head, Kitchen table like Arlie Brewer, sometimes a Truck Camper like Bill Abel. And, if you are good to him he will let you borrow some of these items. Many of our Happy Campers emulate Mr. Ralph. So know everybody brings everything that they think that they might need. You can imagine all of the stuff that shows up on one of our camping trips. This picture is after the rain has stopped on our 2002 journey. The reason that I wanted to share this with you on the main page is because we plan, pack, save and do everything all year long in preparation of what you see here. This is what it is all about. Getting together with close friends and making new friends around a roaring campfire and enjoying the great outdoors. Shortly before this picture was taken we had our Elder, Jr Elder ceremony. As I was reviewing this page after set up I noticed what appears to be someone or something hovering over our camp. Vary unusually! I invite you to share with me and the other Manly Men what your thoughts are for our Web site. Please feel free to send your comments to the address below. We will respond.